Bookeye ® 4 V2 Kiosk was designed specifically as a self service book scanner or self service book copier. A casual user, from any walk of life, can quickly and easily operate this device. In libraries, archives and other public institutions, the Bookeye® 4 V2 Kiosk is often found as an integral part of the infrastructure. Through the freely configurable touchscreen, the user interface of the scanner can be precisely matched to the requirements of the customers (and to their corporate identity). The unique book cradle solution allows users to digitize bound documents at a resolution of 400 dpi and A2+ in size, by either lying them flat on the scanning bed or in the V-cradle, at an angle of 120 degrees. The integrated 22 inch preview screen allows the operator to control image quality and make some modifications on the fly. Scanned images can be output to USB, eMail, network, printer or on a mobile device like an iPad or Android tablet. Scan2Pad enables wireless connection of the Bookeye ® 4 V2 Kiosk directly to mobile devices like iPads and Android tablets. 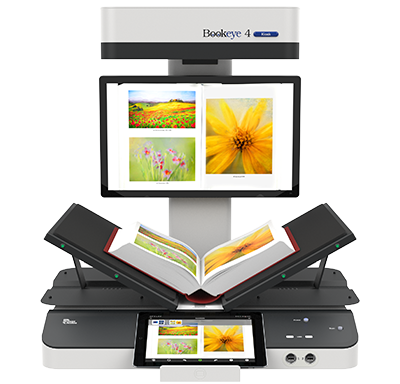 The book scanner can be operated directly from your iPad or tablets and the scanned images are available immediately on the mobile device for further processing and storage. With Bookeye ® 4 V2 Kiosk and Scan2Pad, data transferred are secured via WPA2 encryption. Scan2Pad uses the extensive functionality of the Bookeye® 4 V2 Kiosk scanner. This includes creation of PDF files, automatic size recognition of the source document, color, grayscale and black and white scanning and of course, the well known high quality image results. Bookeye® 4 V2 Kiosk Does the Accounting For You! The Bookeye® 4 V2 Kiosk copier has an integrated billing module. This means that for all applications that do not have an existing card or billing system, Bookeye® 4 V2 Kiosk can take over the billing itself. Configurable invoice printing and journaling are standard functions in the Bookeye® 4 V2 Kiosk as well as the remote locking / unlocking of the system. For applications that do have an existing card or billing system, the Bookeye® 4 V2 Kiosk integrates with its billing interface. Examples of these kinds of billing systems include Schomäcker, Cartardis, Höhr or InterCard. For kiosk systems that can be operated offline, there is also the possibility of connecting a coin operation device.